Although most of us enthusiastically commence our careers, very few of us do so with clear-cut goals in mind. The corporate scenario is rapidly changing with globalization, economic growth and other complex issues affecting the capital markets and employment conditions. In this scenario, actively managing ones career has become very important in order to achieve success. 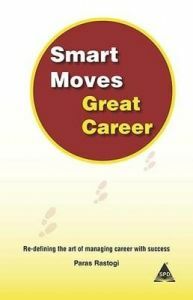 Smart Moves, Great career offers compelling ideas to help the reader break through the chains binding him down and achieve optimum career growth. More importantly, this book helps the reader achieve this success with a positive and optimistic mindset. It also considers the need for every individual to maintain harmony in his/her personal life while pursuing his/ her career. Smart Moves, Great career will provide you with proven methods to navigate and succeed in the complex and challenging corporate world. Smart Moves, Great career will not only help individuals who are starting on the exciting journey of their career, but also individuals who are well entrenched in the corporate world to help them achieve new heights in their career. Incredible book, taking a holistic view on the career management and with key examples to explain the tricky career situations. Dr Rajan Saxena Vice Chancellor & Distinguished Prof of Marketing SVKMs Narsee Monjee Institute of Management Studies(Deemed to be University), Mumbai, India This is an exceptionally informative and well written book that offers great pointers on how to avoid pitfalls and traps at various stages of career. N.Muralidaran, CEO, NSE Infotech Services Ltd, Mumbai The book is very relevant to the current competitive scenario and will be extremely helpful to the individuals in planning and managing their career. Y. P. Sahni, Ex President & Chief Operating Officer, TATA Consultancy Services, Mumbai, India. Paras Rastogi, works with a multinational company. He belongs to a family of doctors. However, he chose to go down a different career path. He did his engineering and then successfully earned an MBA specializing in marketing from SP Jain Institute of Management. He writes in diverse areas including short stories and techno management articles.